To join the AICC and receive membership emails, please click here and fill out your details. Annual membership has been held at the same level since 2011: £40 for non-medical and £80 for medical. Payment of the 2017-2018 membership fee includes free attendance at the 2017 annual AICC conference in Belfast, but paying your membership fee also allows voting and standing in council elections and supports AICC activities. An invoice for fees due will be sent to your email account in August 2017. Please pay by direct debit through the GoCardless system as this keeps our administrative costs low. What is a GoCardless Account? GoCardless is a payment service authorised by the Financial Conduct Authority in the UK. Think of it like PayPal, but it offers the benefit of annual automated Direct Debit payments direct from UK bank accounts. Is this Direct Debit email a hoax? Phishing emails are a major security concern. You should check that: the email received is received from theaicc.org and addressed to you by name; and the personal link given starts with ‘https://aicc.quickfile.co.uk/’. All 2014-2015 members should have received the email (example above) on 8 September 2015; we will warn in the preceding newsletter of any such future emails. If you would like it resent, let us know. No, but we would prefer you to if you have a UK bank account. It keeps our administration costs low for the future. For this year, manual cheque and BACS options remain (online invoices contain details). 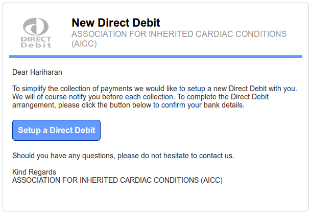 Can I sign up for Direct Debit using a traditional paper form? Direct Debit is restricted to the GoCardless online service to keep our costs as low as possible. Payments are covered by the Direct Debit Guarantee, which means you can cancel a Direct Debit mandate at any time by contacting your bank. We would appreciate an email to let us know if you do so, particularly if an invoice has already been issued. Yes. Our GoCardless Direct Debit payments are exactly like those you might use to pay your utility bills. They are bound by rules stating that you must be informed of any payment collections in advance, and guaranteeing that you will get your money back if anything bad, like fraud, happens. Can I pay online without Direct Debit? Yes. GoCardless allow one-time payments direct from your UK bank account using a process that is valid for a single transaction only. Credit card payments incur additional charges, so are discouraged except for non-UK bank account holders. Contact us and we can issue your membership invoice on 1 October 2015. Yes. You will be issued with an online invoice that can be saved as PDF. The direct debit payment will be claimed from your account 14 days after the invoice is issued; the invoice will update to reflect the paid status 10-14 days after that. We will, of course, be sorry to lose your support. We intend to issue annual invoices for membership indefinitely (or until cancelled by email notification) for all members. To cancel, email us.